The tender beef in this dish practically melts in your mouth. Along with saucy noodles and crisp veggies, it’s a delicious way to get a filling meal that everyone will love onto the table fast. I know why you’re here. You want to cut out the middle-man and get authentic Chinese food on your table fast without having to wait for delivery or go pick it up. Fortunately. 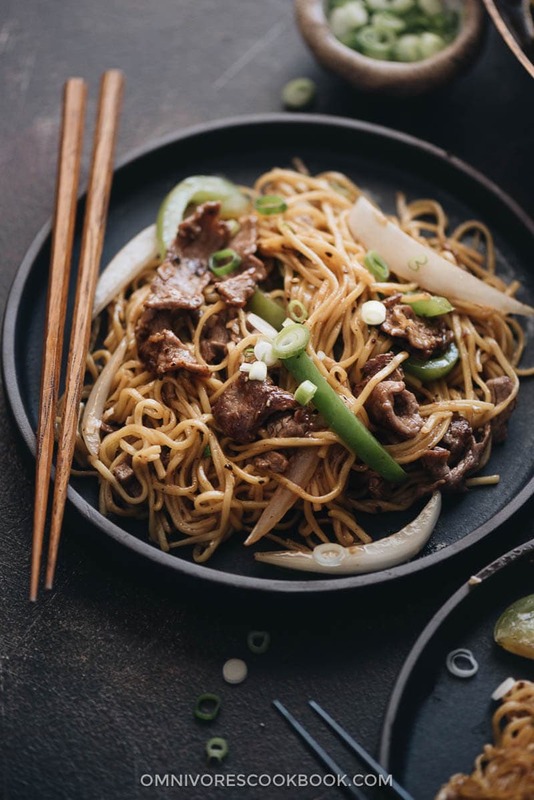 my Beef Chow Mein recipe is super simple and quick. 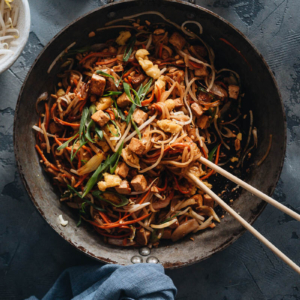 You’ll be eating this version before your order from your neighborhood Chinese restaurant arrives, so why not make it yourself? One thing that I’ve noticed is that people shy away from cooking Chinese food because they don’t have a wok. 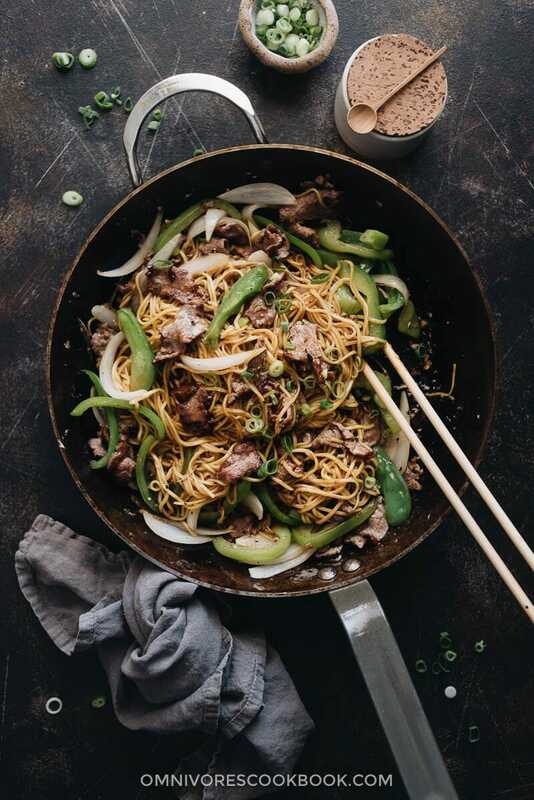 I’m here to tell you that you don’t *need* a wok to make this recipe. You can use your skillet. 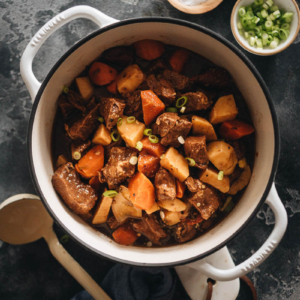 Just make sure your pan gets hot enough and you use plenty of aromatics with my sauce recipes and I promise you, it will taste like that Chinese restaurant you love, but it will be faster and cheaper! Flank steak generally works the best for this recipe, and it’s more budget-friendly too. But if you only have tougher meat options on-hand, don’t stress it. You can tenderize any tough beef by adding about 1/4 teaspoon of baking soda onto the beef and then adding the marinade to it discussed in the recipe below. As long as you don’t go crazy with the baking soda, you won’t notice the taste and it will help tenderize your beef. Don’t forget to slice it against the grain to get that melt-in-your-mouth buttery texture that makes this dish a success! Choosing the right noodle is important too. 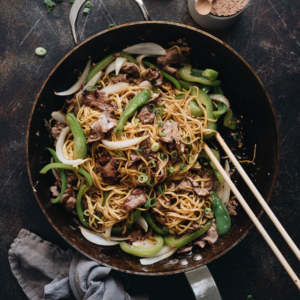 You don’t want to use the short, crispy fried kind that are usually labeled as “Chow Mein” noodles. 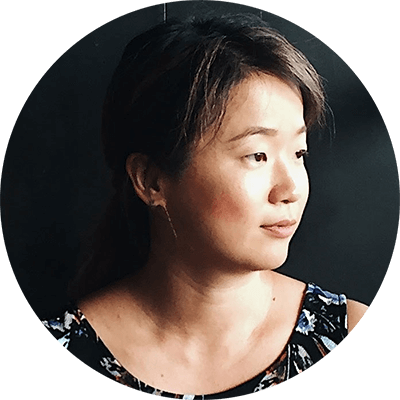 Look for the longer ones that will typically say “Chow Mein Stir Fry Noodles” or “Lo Mein Noodles.” Alternatively, you can use udon noodles or Korean wheat noodles. Are you gluten-free? 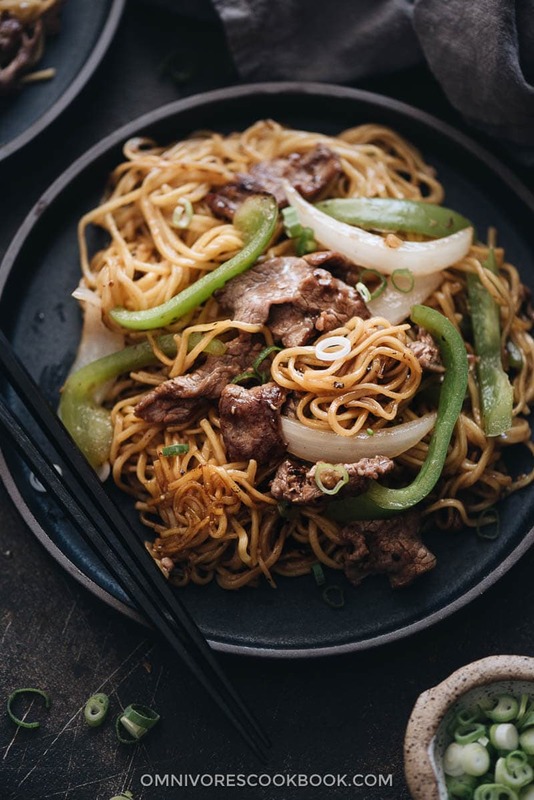 If so, you can still enjoy my Beef Chow Mein by using rice noodles. It will give it a different texture but it will still be wonderfully delicious! As I mentioned before, you don’t need a wok to make this dish though you should take care not to overcrowd your pan. That leads to uneven cooking and chaos. 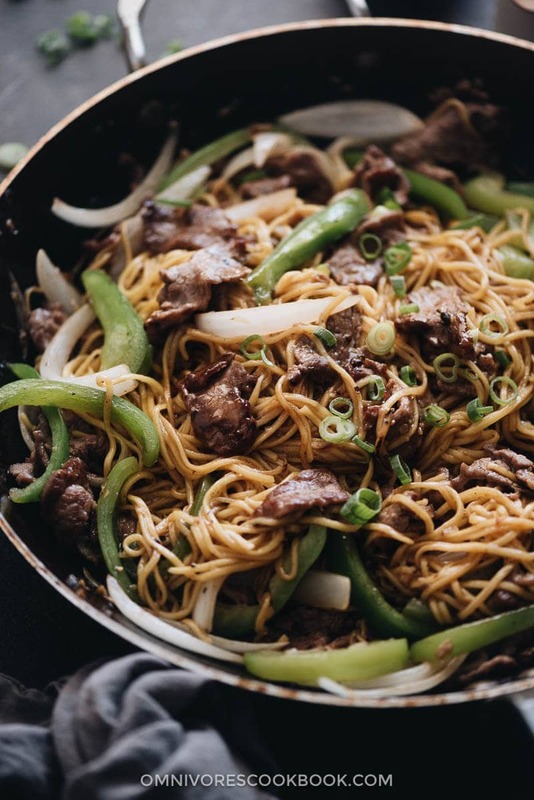 You’ll also want to make sure you use plenty of fresh garlic, ginger, and green onion because it gives your beef chow mein that authentic taste. Aromatics are essential in getting that Chinese flavor perfected. Plus, they’re good for you too! 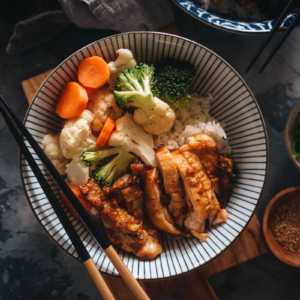 While it may seem hectic at first to make Chinese food at home, if you prepare your ingredients and set them nearby your stove so they’re ready when you are, you’ll make your workflow go so much more smoothly. 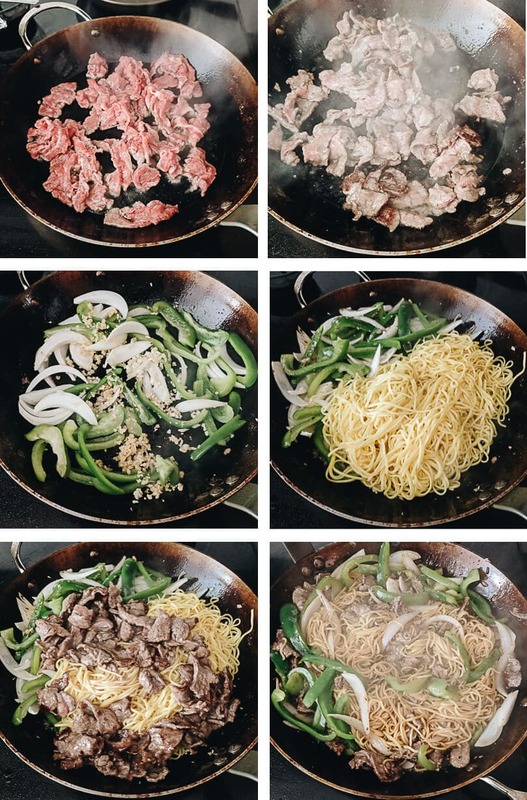 It really doesn’t take very long to make Beef Chow Mein. 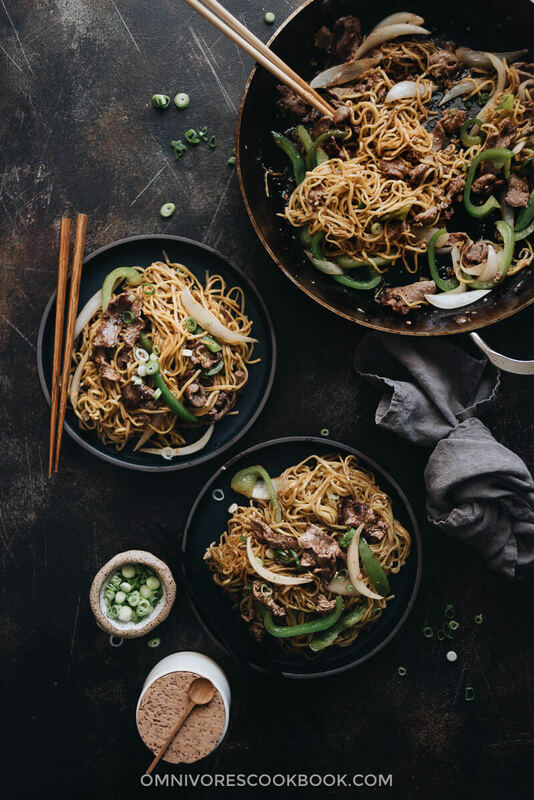 Having everything you need measured and within arm’s reach makes it really easy to achieve authentic Chinese food perfection in your own kitchen. Once you make it the first time, every time you make it will go faster and smoother! Heat 2 tablespoons oil in a large nonstick skillet over medium-high heat until hot. Spread the beef in the pan. Cook for 30 to 45 seconds without touching, until the bottom browns. Flip to cook the other side for 30 to 45 seconds, stirring occasionally, until the beef is lightly charred but the inside is slightly pink. Transfer to a plate. Add the remaining 2 tablespoons of oil. Add onion and peppers. Cook and stir until the veggies just start to turn soft, 1 minute or so. Add the ginger, garlic, and green onion. Stir a few times to release the fragrance. Add the noodles. Toss a few times with a pair of tongs. Add the cooked beef back into the pan. Pour the sauce over the ingredients. Toss to mix everything together well. The noodles are done when the sauce is absorbed, 1 minute or so. I haven’t tried the recipe yet but I just wanted to leave a comment you refer to flank steak as being a more budget friendly cut of meat I don’t know where you buy your meat but where I live as one of the most expensive cut of meat. What would be a good substitute using an even more budget friendly cut?